View Dan Petrovic’s custom electric & bass guitars below. 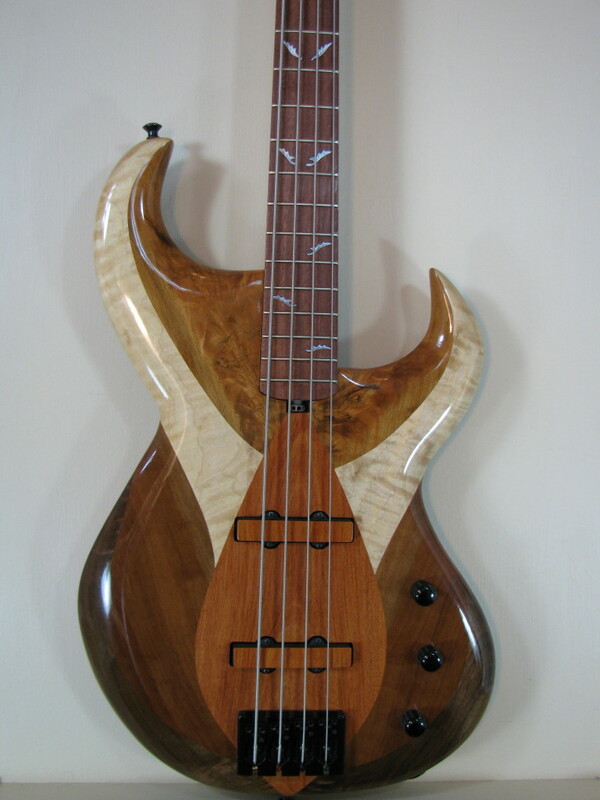 This one-of-a-kind handmade instrument is made from solid woods and veneer. The bolt-on neck is made from curly Maple, burl Walnut veneered headstock with inlayed DJP logo, Indian Rosewood fretboard with 14” radius, Mother of Pearl inlay, polished medium/tall nickel-silver frets, bone nut, Gotoh locking tuners, two-way “spoke nut” truss rod. 25” scale length. Two piece alder body (painted black) topped with figured veneers, curly Maple binding, curly Cherry component covers, Rio Grande “Vintage Tallboy” pickups, Wilkinson floating tremolo, high quality electronics, Indian Rosewood knobs, shielded control cavities, straplock system. Finished in poly and lacquer. This floral inspired bass features a uniquely sculpted body made of wild Cherry, figured Maple, Walnut, Quinilla, Tiete Rosewood, and African Mahogany. It has a 34 inch scale length with a 12 inch fretboard radius, a wide/medium nickel silver frets, as well as Quarter-Sawn Maple bolt-on neck, Bloodwood fretboard with Mother of Pearl leaf inlays and side dot markers. This bass also has a dual action “spoke nut truss rod,” and a headstock adorned with the DJP logo and repeating floral motif made up with the same woods as the body and fretboard. It also has Gotoh tuning machines, an adjustable Hipshot bridge, and the pickups are Bartolini 9J1 L/S. In addition, it is outfitted with CTS volume and tone control pots, along with a electrosocket that will never come loose. It is finished in poly. Neck-through design made of Honduran Mahogany. Bocote top plate, headstock veneer, and component covers. Inlaid Ebony truss rod cover. It has an Ebony fretboard with 20” radius, abalone inlay, medium/tall nickel silver frets, two-way truss rod. This guitar features a 640mm scale length, Schaller tuning machines and roller bridge, DP 103 and DP 101 Dimarzio humbuckers, bone nut, as well as custom made Zircote knobs and Walnut pickup rings. It is finished in poly. Hand carved Flame Maple top braced with a reclaimed piano sound-board brace. Honduran Mahogany and Walnut body. The Mahogany neck is set into the body with a sculpted heel for a smooth transition and features a two-way “spoke nut” truss rod. The 24 fret, 12 inch radius Honduran Rosewood finger board is adorned with custom Mother of Pearl and Abalone inlay. Bone nut and 2 piece saddle. The pickup rings, bridge, and knobs are custom made from Honduran Rosewood. The ebonized Cherry tailpiece is also hand made. Hand wound pickups feature enamel-coated wire with an Alnico 2 magnet in the bridge and Alnico 3 in the neck. The push/pull coil tap switch adds versatility of single coil tones. A Neutrik locking output jack keeps the cable secured. Chrome Grover locking tuners and Dunlop flush mount strap locks. Finished in shellac and poly.